The swimming season at Ontario Beach Park is open from the Friday after Father's Day until Labor Day. Swimming is allowed daily 11:00 a.m. to 7:00 p.m. during the summer. For water conditions call 585 753-5887. Equipment and toys are available for rent, and free swimming lessons are offered. Free swimming lessons are offered every Wednesday, from 10 - 10:45 am (5 years old and up). Please call the beach hot line to be sure swimming is open. Life jackets, kickboards, floats, water toys, sand toys, footballs, etc. are all available free to borrow from lifeguard staff. Ontario Beach Park is open daily 7:00 a.m. until 11:00 p.m. Glass, pets, and amplified music are not allowed. The five open air shelters come with picnic tables, grills, electricity, water and bathrooms nearby. The Roger Robach Community Center is available for weddings, parties, and picnics! It is located beachfront at Ontario Beach Park (180 Beach Ave, Rochester, NY 14612. Photos are available in our reservation system or can be sent to you via email by our reservations staff. Our 6 pickleball nets at Ontario Beach Park open for the season in early May and are open through late October. They are located at the Roger Robach Community Center on Beach Ave.
Click here to be linked to the Ontario Beach Park Program Committee's website. The Historic Dentzel Carousel is open from Memorial Day through Labor Day. The cost is $1 per ride and children 2 and under ride for free with a paying adult. The carousel has also been modified to accommodate ADA accessibility. 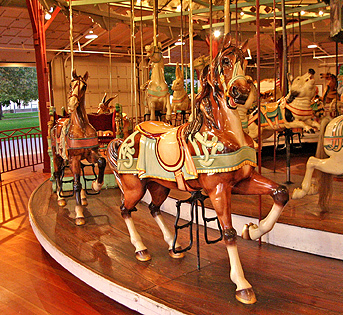 The carousel was carved and created by the firm of G.A. Dentzel in Philadelphia, Pennsylvania. It was installed at Ontario Beach Park in 1905, and has remained in its original location, ever since. The carousel is a menagerie model and consists of 52 riding animals and two chariots, set in three rows. The hand-carved animals include: 22 Jumping Horses; 11 Standing Horses; 3 Cats; 1 Deer; 1 Giraffe; 1 Goat; 1 Lion; 2 Mules; 3 Ostriches; 3 Pigs; 3 Rabbits; and 1 Tiger. In 1984, the County initiated a complete restoration of the animals to their original condition. There is one playground in Ontario Beach Park. See the park map for specific locations. Ontario Beach Park has many different water activities. Swimming is allowed daily 11:00 a.m. to 7:00 p.m. between the Friday after Father's Day until Labor Day. For water conditions call 585 753-5887. Equipment and toys are available for rent, and free swimming lessons are offered. Fishing is allowed in Ontario Beach Park as long as those fishing are not in the swimming area, and are following NYS Department of Environmental Conservation guidelines and rules and have the required licenses. 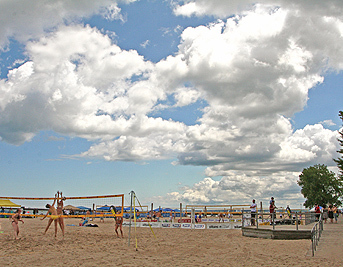 Ontario Beach Park has six beach volleyball courts that are available for rent. Click here for the Special Use Application or call 585 753-PARK (7275) for more information. The baseball fields are scheduled and managed by the Charlotte Youth Association.